We believe in God, we serve God, we trust God, but would we say that we experience God on a day to day basis? Do we really know him personally? What exactly does a relationship with God look like, and how is it even possible? In this seminal work by Tim Chester, we’ll see how the three persons of the Trinity relate to us in our day-to-day lives and how to respond. We’ll discover that as we interact more with God, and understand how awesome he is, we will experience the joy of being known by the creator of the universe. Every Christian will benefit from discovering the key to enjoying God in every moment of everyday. Tim Chester’s books are always unusually accessible. He can distill great amounts of complex theological truth into short, digestible chapters. In this book, he brings this skill to bear on the subject of communion with God—perhaps the greatest privilege of a Christian. But it is one little understood, and even less is it actually enjoyed. I urge you to read this volume. It will make you hunger and thirst for fellowship with God. Winsome in its unpacking of theology and compelling in the sweep of its applications, "Enjoying God" is neither an essay on the Trinity nor a "how to" manual, but something close to both. It is among the best of the rising number of books that instruct Christians on how to cross the bridge from enjoying God on the Lord's Day to enjoying God every day. 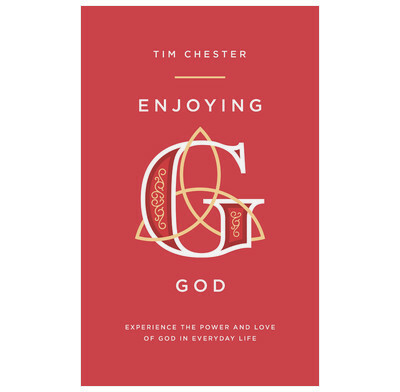 Tim Chester is in no danger of making God little more than a useful utility to increase our pleasure; he is far too God-centered and gospel-centered for that. But if we desire to experience for ourselves a little more (one of Tim's favorite words) of the truth that in God's presence there are pleasures forever more, we shall be hard-pressed to find a better guide. We talk a lot about knowing and glorifying God, but what about enjoying him? And not just as an abstract Being, but as the Father, the Son and the Holy Spirit—enjoying each Person in all of his difference as well as divine unity? And not just in happy times or at church, but in every circumstance of life? It just keeps getting better and better as you turn each page of "Enjoying God". This book will lift you into the presence of the Source of all joy. Is it possible to enjoy God in everyday, ordinary life? If you want a book that is an easy read, gospel-centered, full of biblical truth and focused on God pick this up and enjoy. At the heart of Enjoying God is the fact that Christians can truly know God and experience His presence in daily life. God is known in the three Persons of the Trinity: Father, Son, and Holy Spirit. We experience Him as we interact with each Person of the Triune Godhead. By faith, all believers are connected to God through the work of Christ, and this union with Christ leads to daily communion with Him. The more time we spend in communion with God, the more we will experience and enjoy Him. Enjoying God is a book that calls us to slow down. Each chapter has some practical application that could require a week (or more) to put into practice. As the type who loves to plow through a book in a few days or a couple weeks, at most, I benefitted from slowing down and savoring each chapter and each topic of application. Some books are perfect for reading in a day or two. Enjoying God is not one of them. It’s like smoking a good brisket and needs time to be pondered over for a season as you apply the action steps and learn to enjoy God more.